I was looking at a sedum today with just the same thoughts. 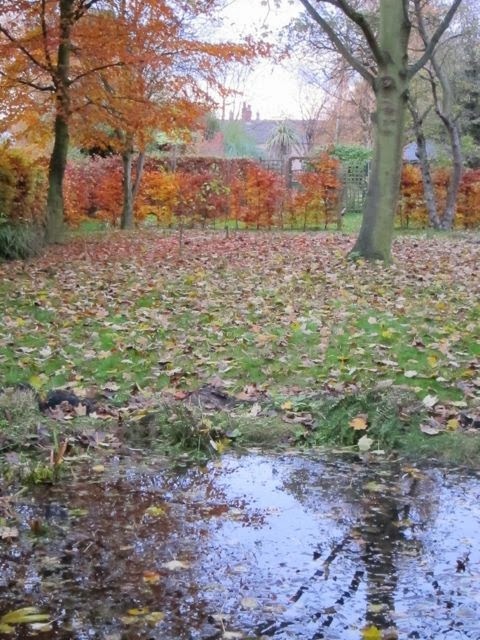 Last night's frost has clobbered it, but the colour is still there. It won a reprieve for now. Hi Rusty Duck, just when do you give it the chop ? Half of me wants it all cleared up and put to bed now, ready for Spring ! Do what I do....turn a blind eye to it until Spring! It will sustain the wildlife......that's what you tell those who question your gardening style! I am struck with the same indecision, especially when it comes to sedums. I like the translucent yellow that one of my favourite sedum turns. Also the flat flower heads become plates that hold snow rather beautifully. So I decided to leave them this winter. The dead flower heads and the roses along the front picket fence all get chopped. It just looks messy otherwise and I am sure my neighbours appreciate that I keep the street view of the garden looking tidy. 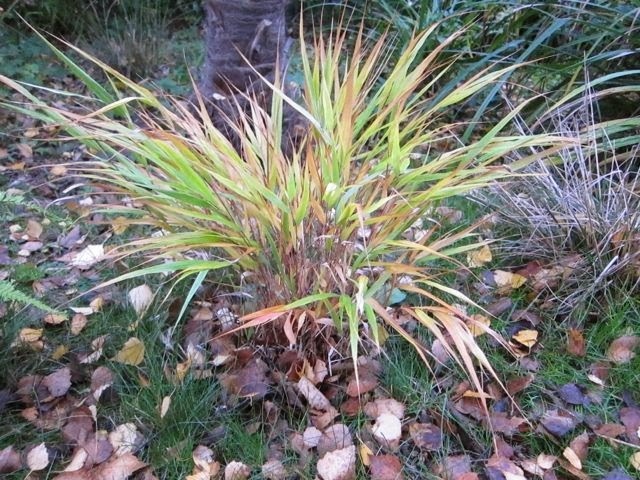 Like you, I agree that the grasses can stay. I also leave anything the birds might like. Other than that, I like to keep the garden tidy, so all the rest gets chopped down. Jennifer, you sound far more decisive than me ! I am such a fence sitter ! It is finding the balance between 'mess' and beauty that I find so difficult. 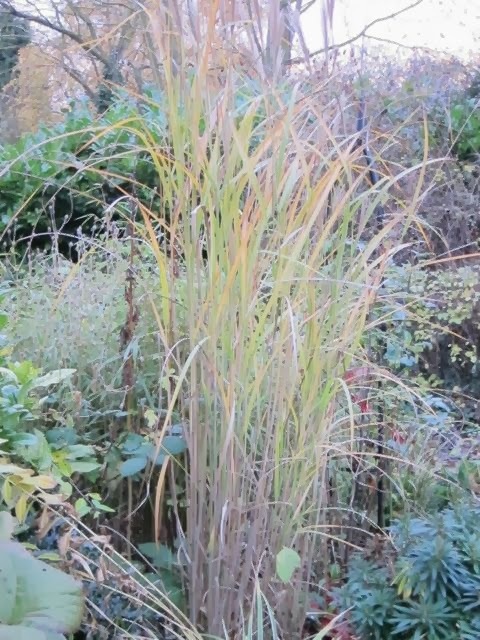 Most things in my garden have had their winter chop. No matter how hard I try I just can't see the beauty in dying plants! My family, rather unkindly I think, say I'm a menace once I get a pair of secateurs in my hands. Ha ! But I bet your garden is a tidy place ! 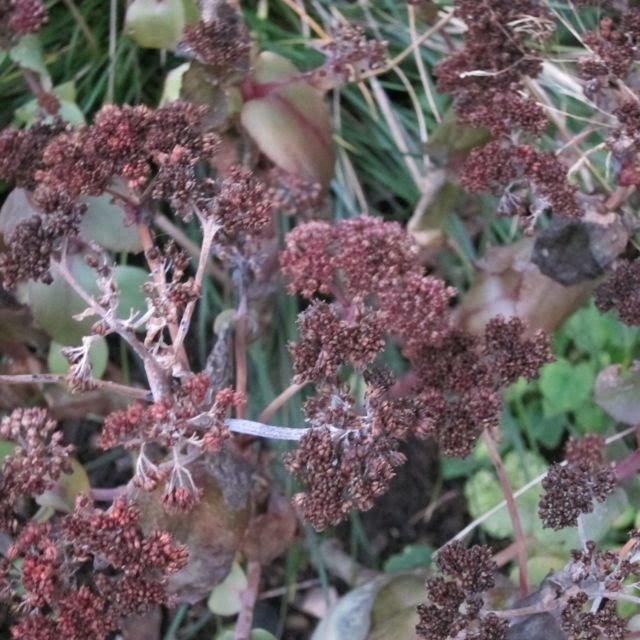 I am completely of your opinion when it comes to sedums' alleged winter interest. Who are they kidding? They look awful. Off with their heads. And that goes for the Rudbeckia too. 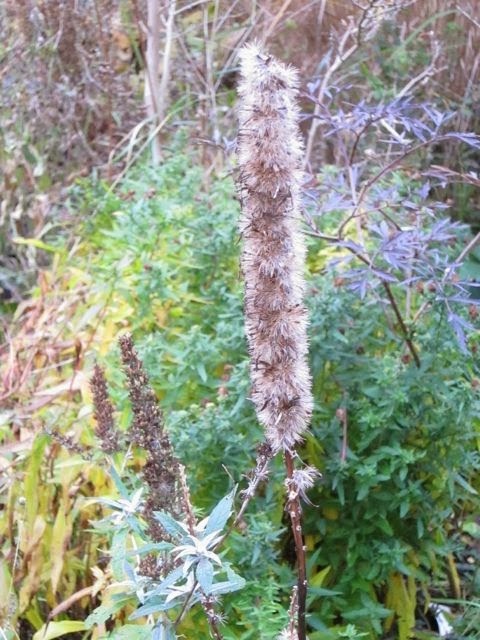 I've fed the birds with standing seed heads for the last 5 years. I've also spent the last five years digging Rudbeckia out of every imaginable place in the yard. No more. I wish Rudbeckia would be a little more prominent in my garden. I seem to spend a lot of time coaxing it to grow as it peeps shyly out from behind something else. Now Astrantia ! Off with every head it possesses ! It is a complete thug ! I'm glad you like the quotes I post. I have fun looking for something appropriate. You mentioned your weather and I guess all of us in the Northern Hemisphere are feeling the results of Old Man Winter barging in. It was 24 degrees F when I woke this morning and the wild has been cold and wild all day. I noticed it was getting dark at 4pm. That's the worst of it........but, come the end of January the days will begin to get noticeably longer.Thank Heaven there's some Holiday festivity to break it up! Hi FF, not only dark early at night, but dark so LATE in the morning ! Getting up time this morning felt like getting up in the middle of the night ! I am a great believer in leaving as much as possible in place for our wilder friends. 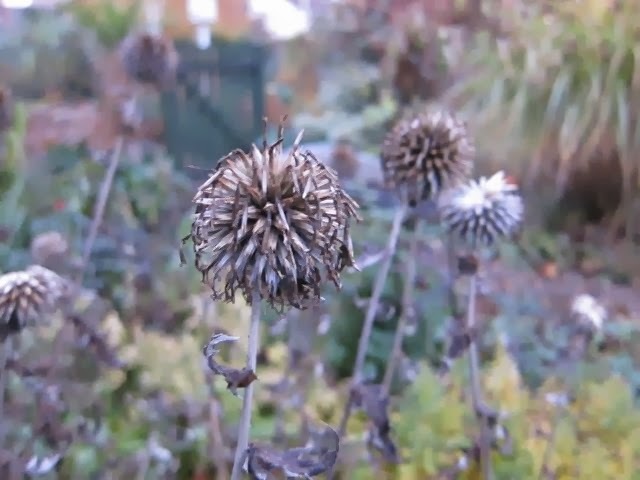 I don't particularly like looking at old seed heads, but the minute there is a sharp frost or snow, I am always pleased I left them as they look great with little white hats on. The benefit to me is that I get to do one massive clear up in spring which refreshes the way the garden looks and makes such a dramatic difference that I feel as if I have really achieved a great deal in a couple of hours. White hats are certainly jaunty ! Like you, I leave things which I think the birds will enjoy and I also leave the 'wild flower' meadow / patch to subside slowly on its own, in the hope that it will self seed and save me some money next year ! bet you feel very virtuous in Spring ! Ha! I think about this all the time. I guess I'm a little lazy in the fall because I used to feel guilty when I would leave everything standing until spring time. 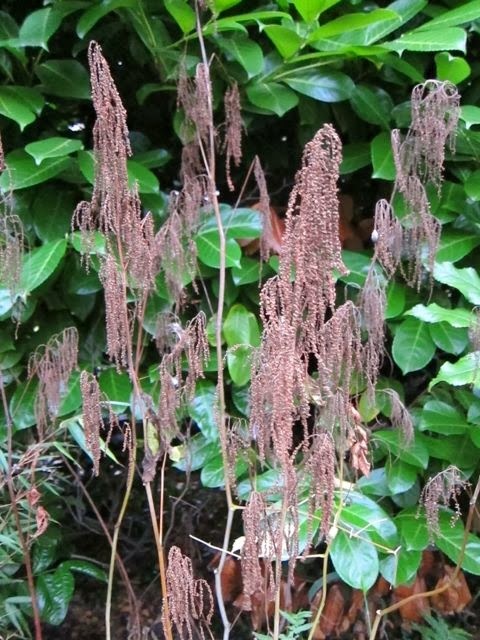 And then during the past few years folks have talked about winter interest and leaving the seeds for birds. Now I'm happy all the way around, because I can clean up when I naturally have more energy (spring), I can watch the birds during the winter, and I can enjoy the winter interest of the snow on the seed heads. Good post! I think that the guilt has been taken out of gardening to a large extent over the last few years so we feel better about leaving stuff. years ago you would have been a bad gardener if you didn't leave your garden squeaky clean by the end of September, now it is a matter of personal choice. Glad I am not alone pondering on this nitty little problem! Hello Jane, looking at your situation now I think that gardening in the tropics is a lot easier :-) I think it is especially hard to let go some good species or rather expensive ones hehe... However, you all are blessed with cool temperature in spring to see a brilliant show of flowers. Happy gardening! Sorry can't help much. Hi Stephanie , I am sure you are right ! 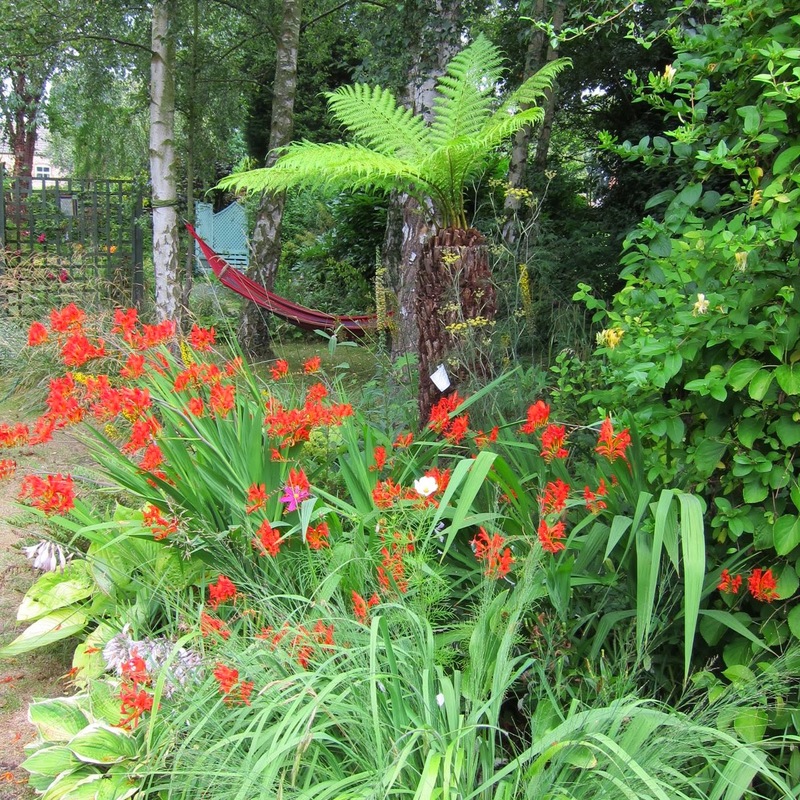 gardening in the Tropics sounds fantastic right now as temperatures drop here in the uk !